Zephaniah 3:9 For then I will change the peoples, so that they will have pure lips, to call on the name of YHVH, all of them, and serve him with one accord. I believe that the pure language is Hebrew. This is the language that YHVH is going to restore. Even in the Brit Chadashah out of all of the languages that Paul spoke, YHVH spoke to him in Hebrew. Since the earliest Hebrew manuscript of the Brit Chadashah’s Matthew referenced is Ba’al Shem Tov’s Hebrew Matthew. It was written in the late 1300s. Many disregard this version as a true biblical Hebrew translation as seen in Richard Rives blog on The Hebrew Version of Matthew- Shem Tob Matthew, Shem Tov. 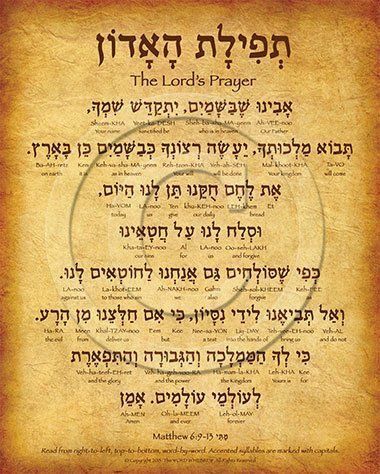 Others, think that Matthew was in the Aramaic language as heard in the blog Lord’s Prayer in the Ancient Aramaic. Until an earlier version is actually found, this controversy will probably continue. Personally, I love this version of the Hebrew Lord’s Prayer by Andrew Hodkinson. If you want to learn how to pray this in Hebrew, click here.